Disney invited us to enjoy dinner at Chef Art Smith’s Homecoming restaurant but my love for his southern cookin’ is all my own! 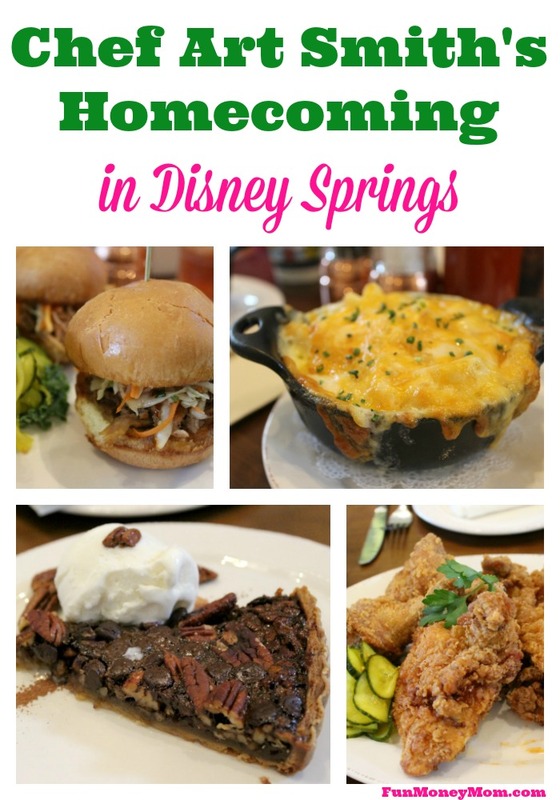 Heading to Disney Springs? 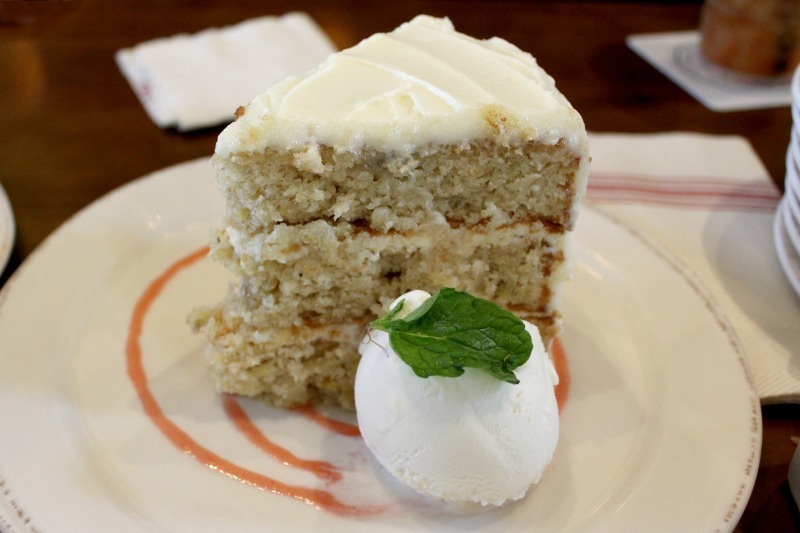 You’ll find so many amazing restaurants that you may have trouble narrowing it down. However, if you like good ol’ fashioned southern cooking, you’re going to want to head straight to Chef Art Smith’s Homecoming! My family loves Disney and we were super excited about our latest mini-vacation. We couldn’t wait to check out all of Disney’s newest attractions! 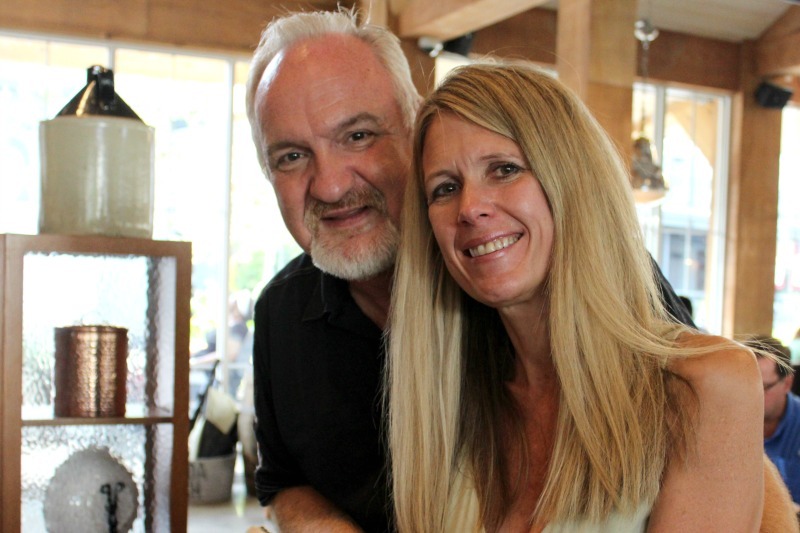 Before we hit the parks, we started our visit with a trip to the newly renovated Disney Springs and had dinner at Chef Art Smith’s Homecoming restaurant. Art Smith is a celebrity chef who worked as a personal chef for Oprah Winfrey (can I please just be Oprah for one day?) and Jeb Bush before opening successful restaurants in Chicago, Atlanta and Washington D.C. He actually started his career with the Walt Disney World Culinary Internship so opening this restaurant in Disney Springs has brought him full circle. 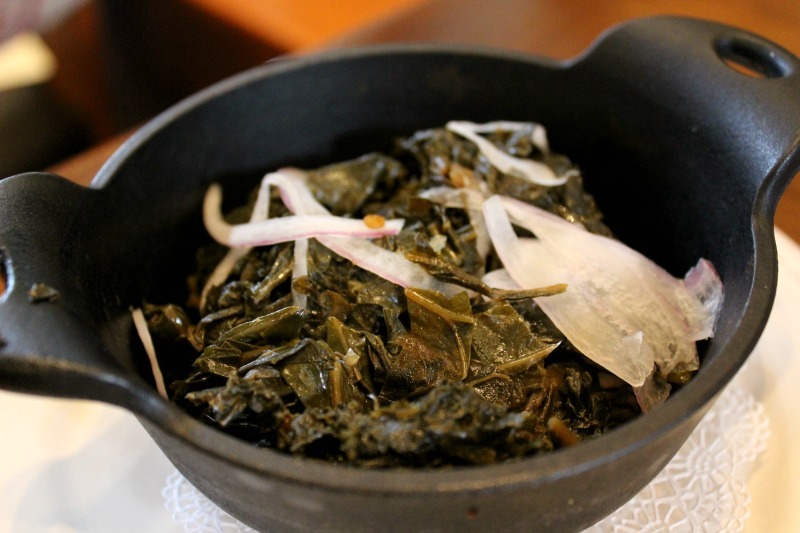 Homecoming is described as a place where Florida heritage meets New Southern Cuisine. Art’s family has lived in Florida for six generations and they still own and raise cattle on their ancestral farm. Like the name of his restaurant, returning to Florida has been a sort of “homecoming” for Art and the majority of their food is locally sourced from within 200 miles. I’m a big fan of the Fresh From Florida campaign and love that Art supports it too. Being from Georgia, I can certainly appreciate good southern food and couldn’t wait to try this new restaurant. The restaurant has a “rustic-chic” look and while the building is fairly large, it feels very cozy. Once we got settled in, we were greeted with a delicious assortment of snacks on the Jasper Board (named after Art’s hometown). 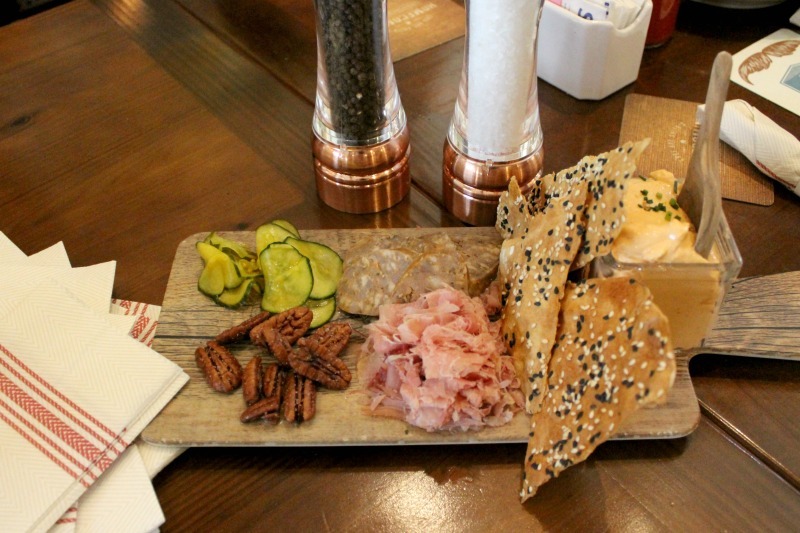 This plate was made up of a combination of pimento cheese, smoked sausage, shaved ham, bread and butter pickles and candied pecans. I love plates with a variety of foods and this was also a perfect appetizer for picky kids. There’s no way they couldn’t find something they liked on this platter! I could probably have made a dinner of the Jasper plate alone…but it was just the beginning! 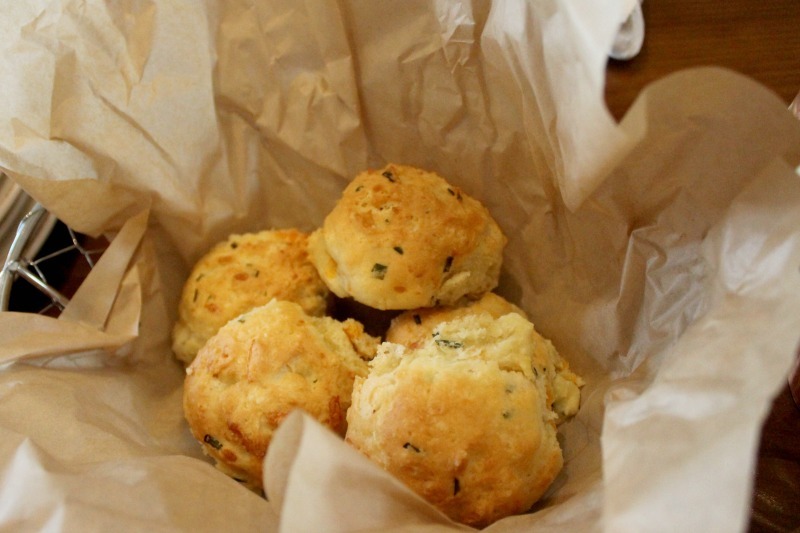 Next we tried the Cheddar Cheese Drop Biscuits and the Bunch Of Puppies. I had to stop myself from filling up on these because I knew the entrees were coming. It was hard though because the cheesy biscuits kept calling my name! 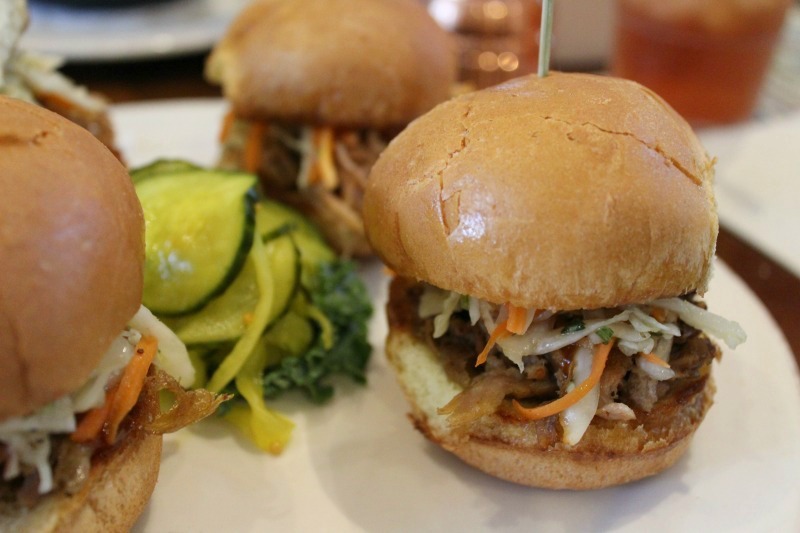 They brought out the chopped pork BBQ sliders and I suddenly wished that I didn’t have to share! I could tell these were going to be good before I even took my first bite! The sweet and spicy BBQ chopped pork topped with southern slaw was one of my favorites of the night…so yummy! Plus, they came with the added bonus of more bread and butter pickles! 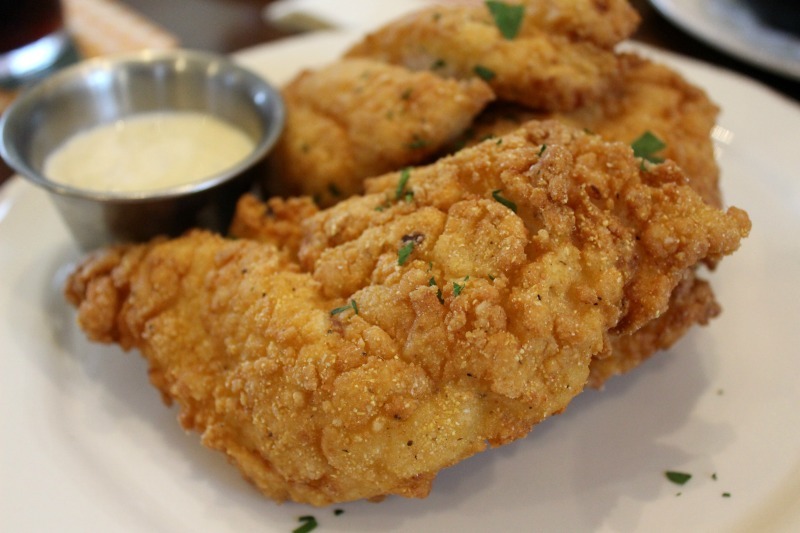 Then it was time for the entrees and you really can’t get more southern than fried catfish and fried chicken. 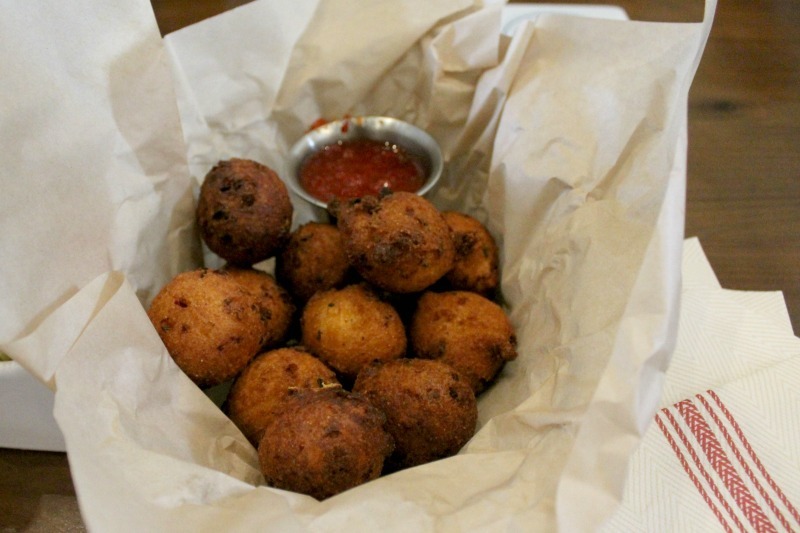 Why does everything always taste so good when you fry it?! The sides didn’t disappoint either. 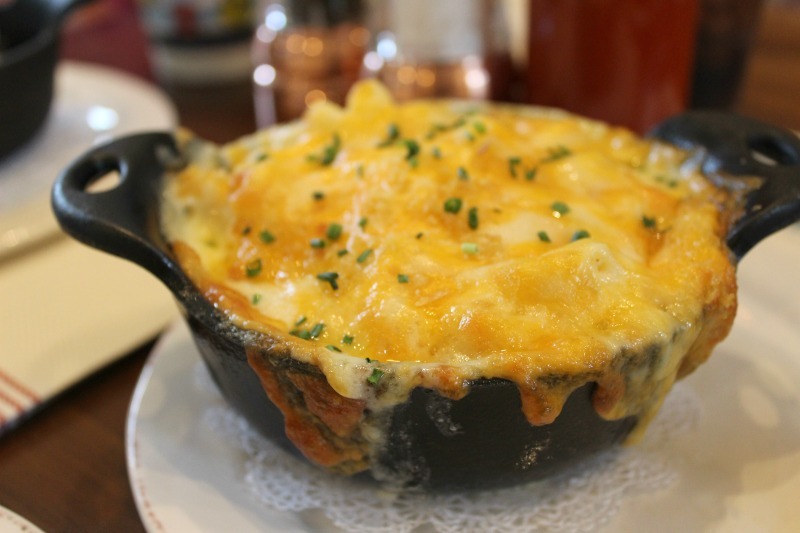 Just look at this gooey Momma’s Mac & Cheese! I didn’t even get a taste until they brought a second serving…the kids ate it all without a care in the world for the grown-ups. Can you blame them? I took a quick break from eating mac & cheese to try some of the other sides. The creamy mashed potatoes were as good as they looked and though I couldn’t get my girls interested in the braised kale and collards, I thought they were pretty tasty. Just when I thought I couldn’t possibly eat any more, they brought out the desserts (and I suddenly found a little extra room)! They were all delish but my favorites were the Hummingbird Cake, pineapple-banana cake with cream cheese frosting, and the Hamilton County Pecan Pie. I’m usually more of a cake person but this pie was amazing! Once again, I had to remind myself to share! After dinner, I even managed to get a picture with the man himself! 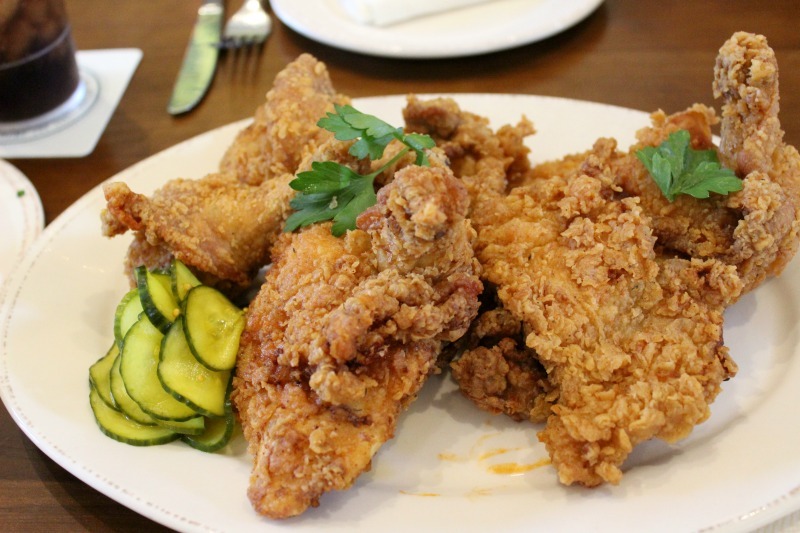 There are a lot of restaurants in Disney Springs but if you are a fan of good ol’ fashioned southern cooking, you’ll definitely want to give Chef Art Smith’s Homecoming a try. 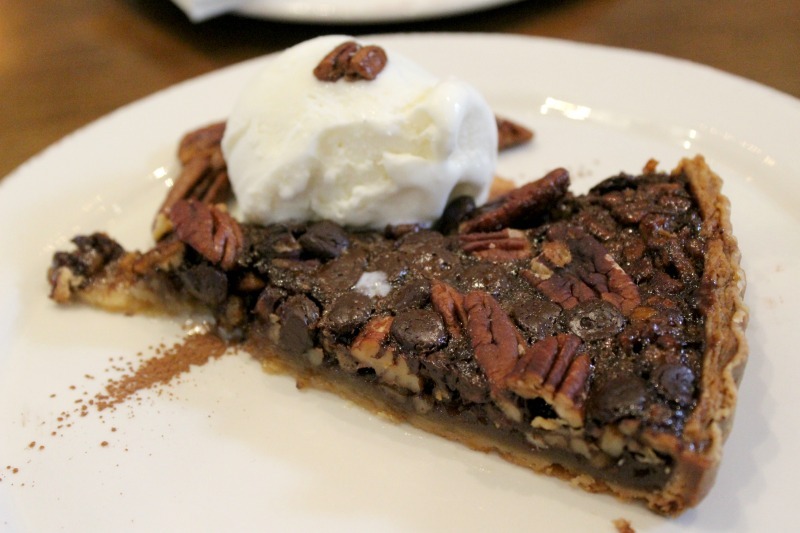 Don’t forget to save some room for a piece of that pecan pie! Looks amazing! I’ve been wanting to plan a Disney trip for my kids for so long, i need to just do it! This will certainly be a stop of ours now, my husband is southern and I have the poor thing living up north haha Thanks so much for sharing ? I like the north but only in the summer…LOL! Yes, you should definitely plan a Disney trip with the family. It really is a magical place and I’d go every weekend if I could! Everything looks amazing! 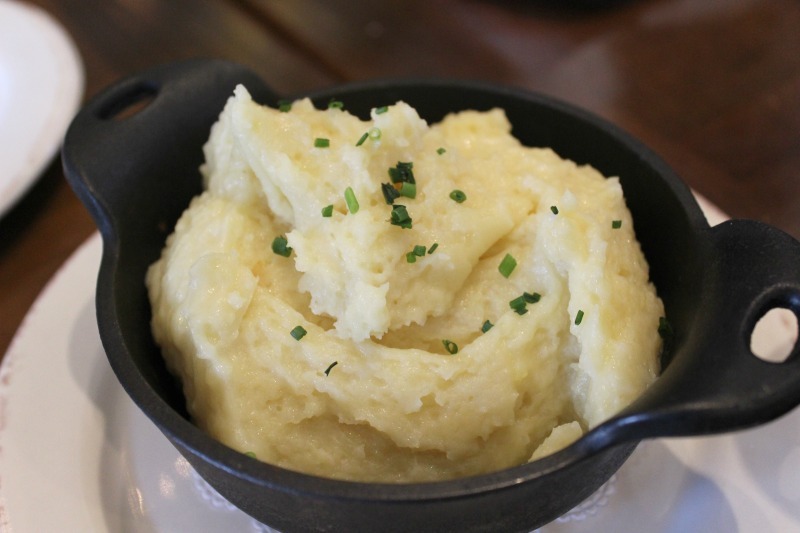 We were recently at Disney Springs but didn’t have a chance to try the restaurant – we’ll have to go next time for sure. Everything looks delicious. I’m heading to Disney with the kids in December. I have a list of eating places that I want to try while we’re there. Not sure if my picky eaters would be interested in trying these goodies. Thanks for sharing. I’ll make a note. Have been lucky enough to have made it there twice now and tried the fried green tomatoes, hush puppies, deviled eggs and pecan pie all were amazing. Will be back .